Greg, I hate to be a pane but it’s time to review Glass. Many years have passed since David Dunn (Bruce Willis) was the sole survivor of a massive train wreck that revealed him to be “unbreakable”. He and his son Joseph (Spencer Treat Clark) now work together to protect women from violent criminals. They learn that Kevin Wendell Crumb (James McAvoy), a troubled man with multiple personalities, is holding a group of teenage girls hostage in a warehouse. While attempting to rescue them, David encounters one of the personalities known as “the beast”. Enter Dr. Emily Staple (Sarah Paulson). She’s trapped David and Kevin and thrown them in a special detention center. She’s studying people with a “comic book delusion” – that they have special powers like characters in comic books. Along with them is the notorious “Mr. 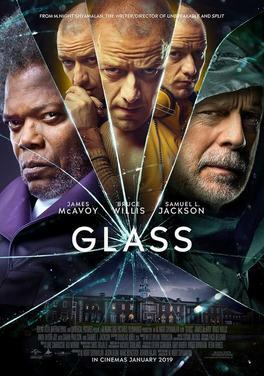 Glass.” (Samuel L. Jackson) Dr. Staple spends the majority of the film interrogating them and trying to convince them they are ordinary people, not superhuman. Greg, Glass is a curious movie that should have been better than it is. We’re given some very good characters, some very good scenes, and a premise with loads of potential. Alas, all these parts just don’t add up to a good movie. It’s an anti-Gestalt pattern, with the whole not being better than the sum of its parts but much less than the sum of its parts. The central problem for me is that there just isn’t much of a story. Our three super-people are institutionalized, interviewed, and must break free of their incarceration. Because we don’t need over two hours of movie-time for these events to transpire, we’re left with a snail-paced story, even by Shyamalan standards. There’s a whole lot of nothing going on for long stretches of time, lots of chit-chat, and interminable scenes of Kevin switching personalities. We don’t need to hear from every member of the horde 15 times each. Another issue is that it isn’t clear who the “hero” of the story is. Is it Dunn’s son? The young woman Casey, who was once Kevin’s hostage? The psychiatrist? The triumvirate of superhero/villains? 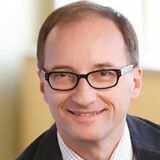 Good stories need a clearly identifiable heroic character or protagonist so that the audience knows and can relate to the hero’s mission and the hero’s transformation needed to accomplish the mission. The ambiguity of the hero role is a striking example of good parts not constituting a good movie. I agree on so many counts, Scott. It seems Shyamalan knows only 2 camera angles now – wide angle and close up. Easily two-thirds of the film is comprised of close up images of characters delivering exposition. I’ve never seen so many talking heads in a movie – except maybe My Dinner with Andre. You’ve nailed it – this was a 30-minute Twilight Zone episode padded out to two hours. I’m not sure if Shyamalan is intending to create a new franchise here or not. The basic premise of the film is that comic book heroes are born from real experiences with super human beings. And that there is a shadow group of people determined to undermine these people because “we cannot live in a society where some among us are gods.” In the end (remember: SPOILERS), all three of our main characters die. So, where do we go next? I believe the answer is – very much the way of the Marvel comics – that there are mutants amongst us and they will have to band together and fight against a system trying to destroy them. Marvel has already played this song – and they’ve just about run it into the ground. There are several other problems with this film. For one, Casey Cooke (Anya Taylor-Joy) returns. In the previous film (Split) she was the “girl who got away” from The Beast. Somehow in this film, she is the love interest for “Kevin” – showing him affection and exposing his weakness – love. But – there’s no evidence for this affection in the previous film. It’s just a new plot device for the added premise that all superheroes must have one “kryptonite.” Another amusing aspect of this relationship dynamic is that she is the cause of his death – echoing the phrase “twas beauty killed the beast” from King Kong. Other problems include: a wasted opportunity for Samuel L. Jackson who spends literally three-quarters of the film in a catatonic state. The near-ending scene where Dr. Staple interrupts the drowning of David Dunn to let him know why he’s being killed (it’s a classic villain’s monologue in the worst possible way). The ending scene where the world is sent a video of the superhuman battle that apparently everyone believes. But in the world of Fake News, YouTube, PhotoShop, and Deep Fakes, who can believe what they see on the Internet? Overall, Glass is a plodding movie that under-achieves. All the pieces of Glass should make for a thrilling, riveting movie, but the achingly slow pace makes all the shards painful to crawl over. I wonder if this is Shyamalan’s last hurrah. He’s a filmmaker with talent who, like his movies, underperforms when there is so much potential and promise. Glass is a constipated movie that either shouldn’t have been made or should have been made with more energy and direction. This is a stained-glass that mars the memory of the very good Unbreakable that preceded it. I give Glass 2 Reels out of 5. As I’ve mentioned, I’m not sure who the heroes are, which making assessing the hero’s journey quite difficult. There are plenty of hero candidates, as I’ve mentioned, and in a way the incarceration of the three super-beings marks the entry of these many characters into the journey. Are they transformed at all? Probably not. But as Elijah labels this story an origin story, then at film’s end there are no doubt many more super-beings about to be forever transformed. I give this film 2 Hero points out of 5. The message here is elusive. I’m going to conjecture that the main message is that the suppression of our “inner-superhero” is neither possible nor desirable. You just can’t tamper with the natural order of things, which kind of sounds like the message of Jurassic Park. I give this message 2 Message points out of 5. Scott, we’re on the same “pane” here. Shyamalan’s storytelling career has been uneven. And in Glass I feel he’s shoe-horning two of his previous films into a superhero franchise. It’s not a terrible film, but as we both observed, it’s terribly slow and expository. However, unlike you, I think the three films together (Unbreakable, Split, and now Glass) make for an entertaining trilogy. I’ll give Glass 3 out of 5 Reels. From the another point of view, this is not the typical hero’s journey. As Elijah points out, it’s an origin story. I’m fine with that. And so, we don’t have much of a transformation for anyone. And it foreshadows that there’s more to come. So, while it is a confusing movie from the hero’s journey point of view, we have to recall that not every story is a hero’s journey. I give our three main characters 2 out of 3 Heroes. Finally, there’s not much of a message here. It’s entertainment for entertainment’s sake. And if it is truly an origin story, then there’s no real message needed. It’s a setup for more to come. I’ll give Glass 1 Message point out of 5. By Greg Smith in 1 Message, 2 Heroes, 2 Reels, 2019, Drama, Mystery, Science Fiction on January 22, 2019 . I found myself liking it more after I had time to process what MNS was going for. It’s a toughie at first but now I’m hoping to see it again. That’s interesting, Keith. Often I need a second viewing to develop an appreciation for a movie.